Best practices are important whether you’re just starting a customer experience (CX) program or looking to build on the progress you’ve already made. This video replay of our recent webinar examines four building blocks of CX success: feedback gathering, alerting, verbatims and reporting. 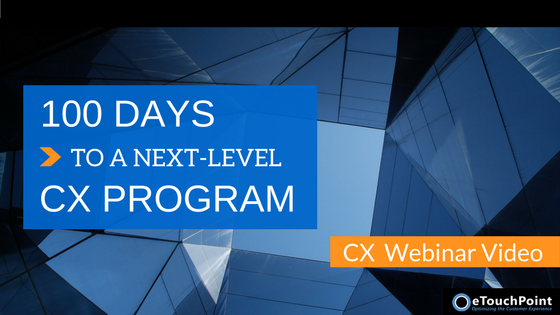 Watch the video to learn more specific steps you can take to improve CX. At eTouchPoint, we are committed to evolving our CX platform by incorporating client enhancement requests and responding to industry needs. On average, we make 250 enhancements to our platform each year. Our recent major product release 8.13 includes important changes to the Dashboard, Reporting, Action Alerts, and Customer Verbatim modules–along with the introduction of a new Survey Definition module. We’ve also continued to enhance performance and security, while allowing users to track and visualize CX data, conduct more advanced searches and exports, and gain more insight on survey campaign results. To learn more about major product release 8.13 and our commitment to evolving our CX platform, visit our blog. CX professionals at most companies often don’t have a clear way to prioritize their projects. There might be thousands of possibilities and hundreds of immediate opportunities—but only time and budget for a handful of projects. To choose the right priorities, you need to rank your most important customer groups and journeys, and then allocate resources to CX initiatives based on what has the biggest impact on your organization. The chief customer officer is one of the newest additions to the C-suite, but this position is growing rapidly. Here’s a 90-day executive action plan that can help CX leaders deliver quick results and make a lasting impact at their organization’s technology and customer experience strategies.